I bet you did a double-take when you saw that headline. Yeah, he's back. That guy who sang "Whole Wide World" so many years -- nay, decades -- ago is here again. He's here with amERICa and it's out in about a week or so on Fire Records. Full of caustic, but never-the-less warmhearted, odes to this country and its denizens, the album is a lot of fun and a pure pleasure to listen to. Stuff like "Sysco Trucks" uses the everyday imagery of life in a country full of highways to make music that is universal and affecting. I mean, whether or not you've ever seen a truck of that name or not, you're sure to appreciate this layered, slightly world-weary ditty. "White Bread" buzzes with a certain degree of menace, while "Days of My Life" recalls Robyn Hitchcock's songs with the Egyptians. The epic-and-hysterical "Boy Band" sounds like The Who rehearsing Tommy tracks while Wreckless Eric unfurls his story over the top of the racket. It works perfectly so don't let that odd description make you think that it doesn't. "Up the Fuselage" adds a Sixties stomp to things, while the superb "Life Eternal" uses music that sounds like "Eight Miles High" to underpin Wreckless Eric's vocals. It's on a song like this one that one appreciates not just the guy's excellent sense of writing a tune, but also his skill in playing it. All cylinders are firing on this one, not just the obviously interesting lyrics. 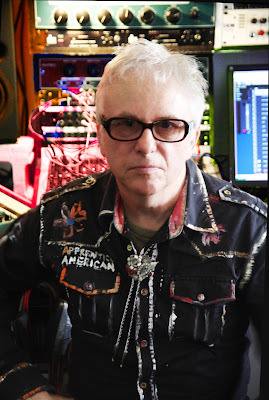 One of the best and more underrated songwriters of the New Wave era, Wreckless Eric is back and he sounds as good as he did back then. It certainly helps that he's back in support of such a strong album. amERICa by Wreckless Eric is out on November 13 via Fire Records.